A renovation and addition transformed this once dark kitchen into a bright, spacious room for entertaining. The owner desired an addition to expand the kitchen and dining room, as well as to add a new pantry, powder room, and side entry. This addition was dictated by an existing overhead roof, which allowed for the ceiling in the new dining area to be vaulted according to the existing slope. 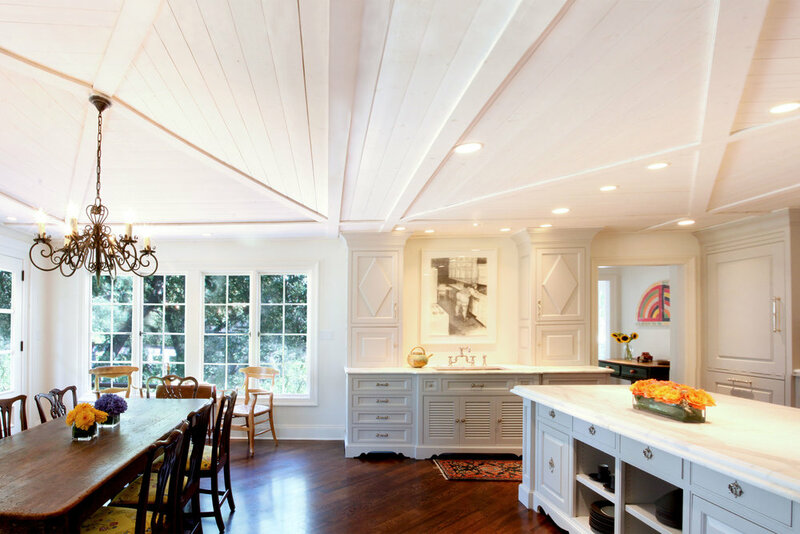 By designing a new wood ceiling for the room, the kitchen and dining area are cohesive and flow together well. The bright white cabinets, which feel more like furniture pieces, help to enhance the lightness of the space. The new dining room truly brings the outdoors in by adding large windows and french doors out to the back patio. The final design is clean, bright, and unified.